The Kristine ID Wallet Pattern Gets Some Publicity! It is fun to release a new pattern and then have one of your testers write a blog post about it! Marilyn Brandt wrote about the Kristine ID Wallet on her blog, Shades of Bold on May 8th. Marilyn did such a great job sewing up not one, but two of these wallets during the testing phase for this pattern. I have already featured one of her wallets on my blog last Friday, but I want to show both of her wallets together in one blog post. I love this brown and blue wallet! The small flowers on this fabric are perfect for the smaller size of this wallet. I also like the brown snap. Marilyn said that she likes to use regular snaps instead of magnetic snaps for a wallet like this and I think it looks great! The front of the Kristine ID Wallet with its adorable envelope flap! The back of the Kristine ID Wallet features a clear vinyl ID pocket. Two pockets for credit cards or other cash cards are securely hidden under the cute envelope flap. 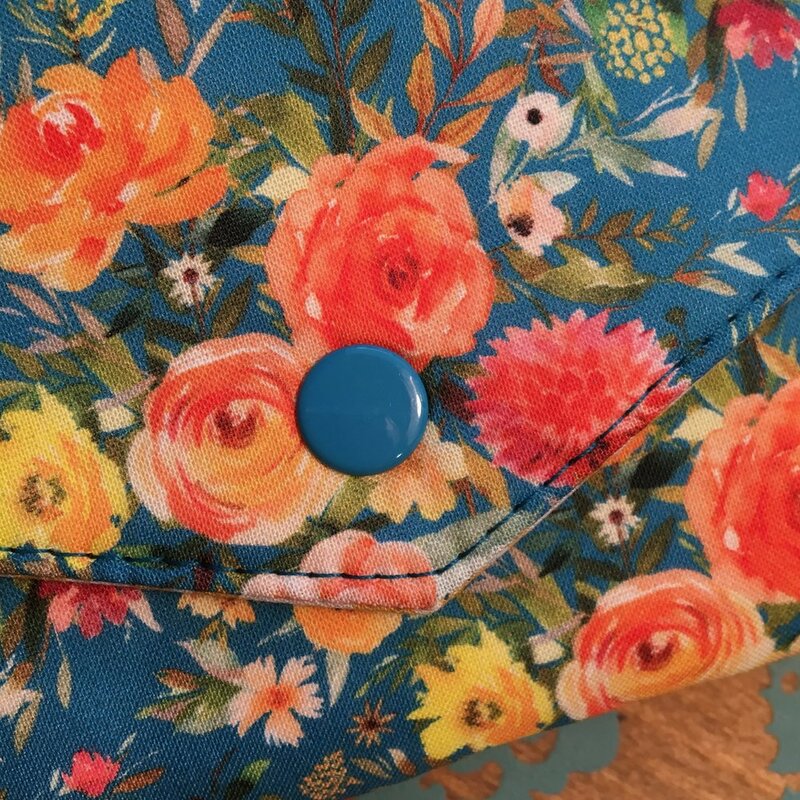 That blue and brown plaid fabric lining the zipper pocket coordinates well with the floral fabric on the exterior! Although you may have seen pictures of Marilyn's bright green Kristine ID Wallet in a previous post, I added a couple more pictures of it here. Again, the green snap goes perfectly with the fabric on this wallet. Marilyn and I both like Snap Source for these snaps - they have nice long prongs and are easy to install with their special "attaching tool." The color selection that Snap Source has is really amazing as well! I love how the underside of the envelope flap matches the lining of the zipper pocket in the next picture! You can purchase the Kristine ID Wallet pdf pattern from my Uniquely Michelle Etsy shop or from Craftsy! Have fun sewing!!! I thought I should start my blog by telling you a little about myself. My name is Michelle Burke, and I am the Michelle in "Uniquely Michelle." Uniquely Michelle is the name of my Etsy shop where I sell my handmade purses, bags, wallets and other items. I love fabric and I love to sew! I have been sewing for about 35 years. I started sewing around the age of 10 with my mom; we sewed a lot of quilts together. I have sewn throughout the years, both out of necessity and as a creative outlet. When my two daughters were little, I made clothes for them because it was a lot cheaper than buying clothes. When we moved into a new house, I made window coverings, pillows, chair cushions, and other decorator items. As people saw my work, they asked me to make decorator items for their homes, and so I started my first sewing business. In the last couple of years, I have enjoyed making and selling purses, bags, and wallets. Not long after I started sewing bags, my two teenage daughters, wanted wristlets and I couldn't find a pattern that I liked, so I designed a wristlet for them and wrote it up as a pattern. They loved it! And now that pattern - The Lindsay Wristlet - is one of the top sellers in my Etsy shop and continues to get great reviews. My next pattern is being tested now by my group of pattern testers, and it should be ready for release at the beginning of next month. I am so excited for its release! As for this blog, I want to write about what I am sewing, the patterns I am designing, and any tricks or ideas I have to make sewing more fun. Although you may not sew yourself, you will get to see my process and my products here, as well as bags designed by myself and others. I mostly want to use this blog as a place where I can express and share my love of sewing and design! I hope you enjoy! Thank you for subscribing to get updates on the latest happenings from Uniquely Michelle! I am committed to keeping those who are interested updated without overloading your email. Thanks again!